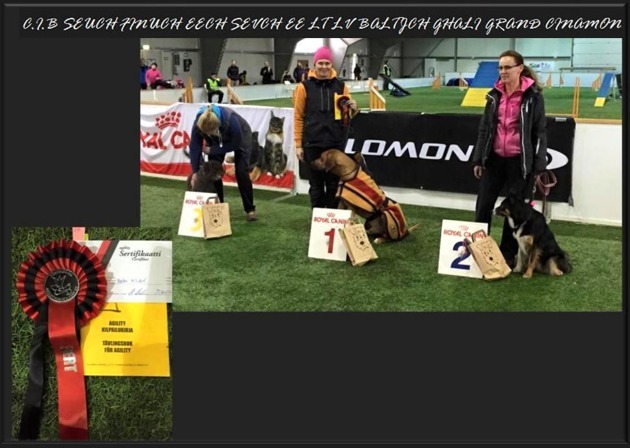 Awena´s Finnish son Multichampion Ghali Grand Cinamon" Vilho" is really good at agility and maybe some of you have already seen the small film clips that I posted here on the website? On this small clips you can see how good Vilho is and with what joy he performs all the obstacles:)! Yesterday participated Vilho and mum Nina in another agility competition . And they won!!! Number one and winner with agility CAC! Which means that Vilho is now entitled to compete in level 2 in agility:)! Huge congratulations team Nina & Vilho! And thank you for sharing, always makes me very happy!! !